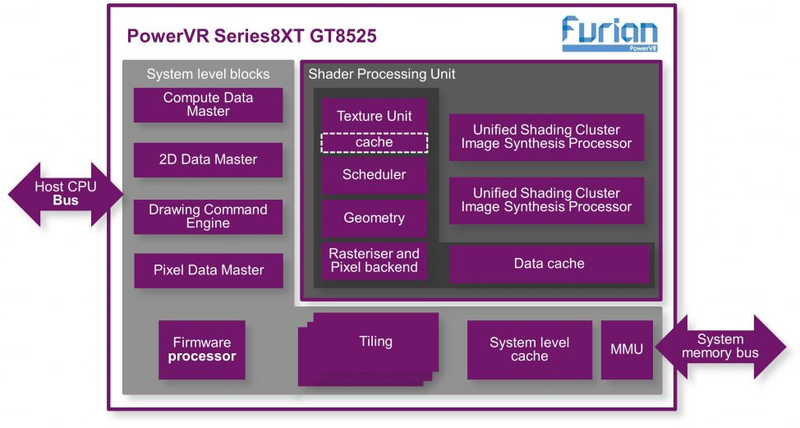 Imagination Technologies has unveiled their first GPU based on PowerVR Furian architecture with Series8XT GT8525 GPU equipped with two clusters and designed for SoCs going to into products such as high-end smartphones and tablets, mid-range dedicated VR and AR devices, and mid- to high-end automotive infotainment and ADAS systems. The Furian architecture is said to allow for improvements in performance density, GPU efficiency, and system efficiency, features a new 32-wide ALU cluster design, and can be manufactured using sub-14nm (e.g. 7nm process once available). PowerVR GT8525 GPU supports compute APIs such as OpenCL 2.0, Vulkan 1.0 and OpenVX 1.1. Compared to the previous Series7XT GPU family, Series8XT GT8525 GPU delivers 80% higher fps in Trex benchmark, an extra 50% fps in GFXbench Manhattan benchmark, 50% higher fps in Antutu, doubles the fillrate throughput for GUI, and increases GFLOPs for compute applications by over 50%. GT8525 GPU is available for licensing now, and has already been delivered to lead customers. More details should eventually surface on PowerVR Series8XT Core page.